"The Tai Hing amalgamation has been fully tested and fine tuned - with its new leaner and meaner look, Tuen Mun is well equipped to face the challenges of the future"
A refined Tuen Mun District is all-set to face the challenges of the future after the amalgamation of its three Divisions into two boosted manpower distribution and cost effectiveness. The success of the Tai Hing (TH) amalgamation project brought about better efficiency and a stronger frontline presence for the public. 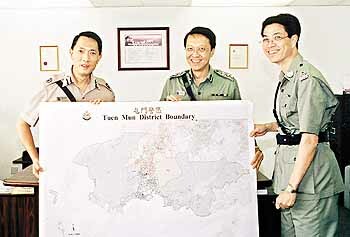 In line with the Enhanced Productivity Programme and Force values on service quality and continuous improvement, the amalgamation improved cost effectiveness through the elimination of a divisional management team (Tai Hing) and the provision of two optimised new Divisions - Tuen Mun (TM) and Castle Peak (CPK). The amalgamation started early last year and was conducted in two phases. TH and CPK Crime Investigation Teams were merged to form larger teams during the first phase (June 1999 to March), resulting in enhanced service and a marked improvement to the District's "C" shift coverage. With these encouraging results, the full amalgamation of the entire District was trialled in the second phase which started in April. TM and CPK were now operating as full-scale "X"-Type Divisions with re-aligned divisional boundaries taking into account workload and population distributions, as well as the area's topographical and demographic features. A modernised beat system, re-organised Crime Investigation Teams with improved structure and shift systems, and the various strengthened Uniform Branch sub-units, were now functioning in a more efficient and flexible manner. 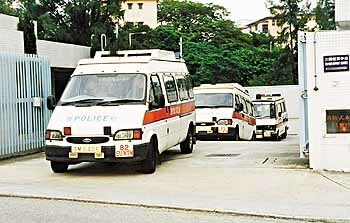 Reporting facilities at the old Tai Hing Police Station were also maintained despite the building's conversion to New Territories North Emergency Unit's West Operational Base. The TH Report Centre continues to provide around-the-clock service with crime reports speedily and efficiently dealt with. TM District Commander Au Hok-lam said: "The public will barely notice the differences except the increased presence of UB officers in the area. Frontline coverage has been enhanced as the strengthened Patrol Sub-units in the two new Divisions are now able to deploy sufficient manpower to cover the 55 beats in the District. "As we have maintained the old Tai Hing report centre, there has been absolutely no interruption to the services we provide." Mr Au said he was very happy with the way things had worked out, adding that the time was right to rationalise the amalgamation. With the taking in of additional officers by the new TM and CPK Divisions from the abolished TH, Mr Au said he fully appreciated the tight yet temporary situation in the two stations, particularly TM Division where building improvement works were in progress. "Every effort is being made to expedite and refine all building works including the Station Improvement Projects in the District which, upon completion, will greatly improve the situation," he said. EU NTN Superintendent Mo Hoi-man said having the TH building as the new western base provided immediate deployment improvements, being conveniently and strategically located within their service area. "Police coverage in TM and Yuen Long Districts is greatly enhanced with encouraging emergency call response rates and response times achieved," SP Mo said. "With the West Operational Base and through other initiatives, the capacity for responding to emergency calls by EU NTN has increased from 1,015 and 978 for the first two quarters of 1999, to 3,785 and 3,826 for the same respective period this year. The average response time also improved from 6 minutes 35 seconds in mid-1999, to 5'41" now." Plans are in hand for other operational units such as Traffic's Accident Investigation Teams and Enforcement and Control Units, as well as the Quick Reaction Force, to also use the building as their second operational base. When the base is fully occupied by mid-2001, around 350 UB officers from all those units would be operating in the area. Rounding up, NTN Regional Commander Ng Wai-kit said: "The TH amalgamation has been fully tested since April and fine tuned. Overall, the project has been a great success and is scheduled as an EPP Year Two item to be rationalised by April next year. With its new leaner and meaner look, Tuen Mun is well equipped to face the challenges of the future."